Flying Kick LA specializes in martial arts training. Today, we practice Martial Arts to further develop ourselves, as we try to create a better tomorrow. Learn more about our Kids and Adult programs that we have to offer! A Martial Art is an art originally developed for the purpose of defense during a time of war. An art form that teaches and trains the mind and body to cooperate and enhance one another. Today, we practice Martial Arts to further develop ourselves, as we try to create a better tomorrow. As an education for your mind while using the body to achieve mental toughness and development, Martial Arts will allow you to discover your own physical and mental potential. Everyone can practice, martial arts does not discriminate based on body type, age, gender, race, religion, disabilities, etc. When you practice martial arts, your energy will transmit to people around you, where they can feel your assertiveness and strength. 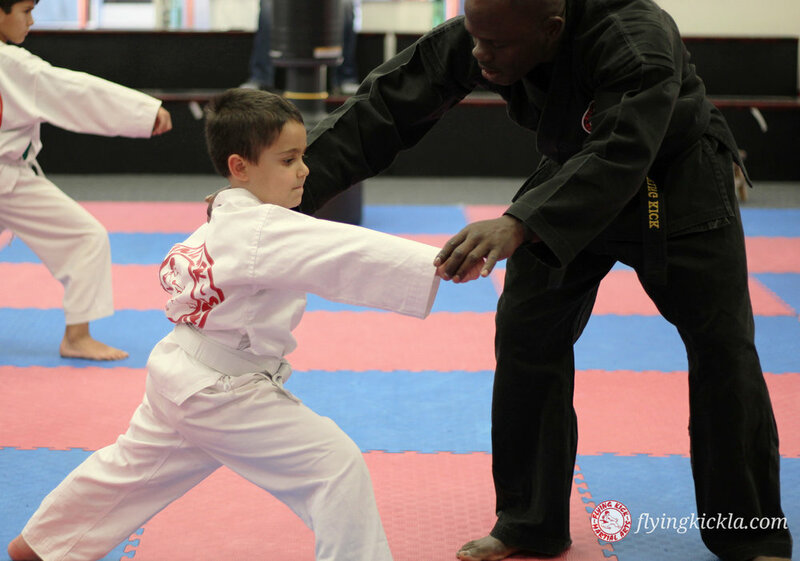 An education in martial arts is the foundation for any child, teen, or adult to begin learning how to defend themselves. The only element holding you back is your mind. By training your mind, your body will follow. We have excellent programs catered towards our students with both physical and mental disabilities. Everyone is included here. While there are almost infinite number of disciplines and variations of them, at Flying kick we have a specific focus. With Chinese and Japanese elements from Kung-Fu and Karate, Taekwondo is a Korean martial art meaning "the way of fist and foot." Specializing in equally using all aspects of the body to create combative, defensive, and artistic movement . Created by General Choi Hung Hi of the Korean Army during the mid 1950s. Taekwondo became the most popular martial art that embodies the spirit, mind, and body together as one. Developed for today’s world, It encompasses the conditioning and growth of an indefeasible spirit. MMA was developed as a spectator sport, using different disciplines to achieve physical fitness, stamina, and the overall goal of dominating the octagon. MMA encompasses a wide range of martial arts disciplines such as Taekwondo, Karate, Judo, Juijitsu, Kickboxing, and more. In addition to martial arts, training in MMA requires intense discipline and self motivation. We will push you to your limits and beyond to help you acquire your fitness goals, whether that be a professional MMA fighter, or simply to build a workout routine. Family plans start at as low as $99/month per student. Not sure? Come in for a free trial class today! It is never too late to get started with martial arts. Gain confidence, agility, mental power and self-defense skills. by partaking in one of our adult programs. Request more info or schedule your free trial class today! Email addressed only used by Flying Kick to send promotional material. You can opt out at any time.